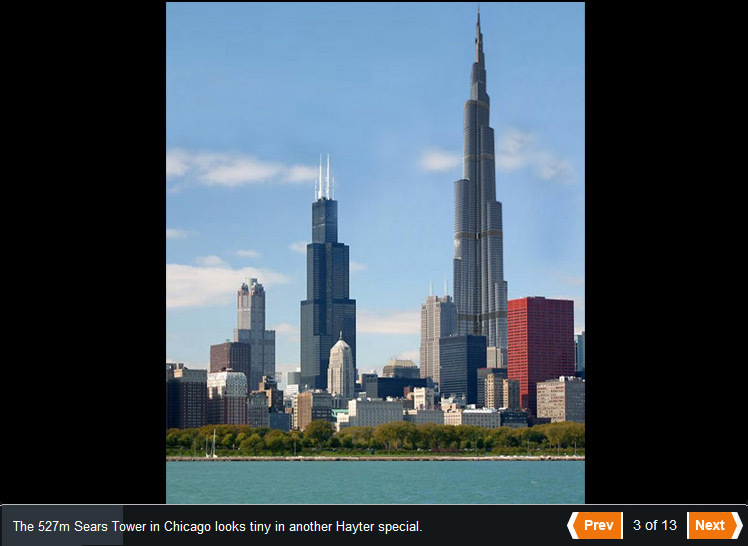 In the spirit of Web 2.0, the folks at ninemsn.com.au invited readers to contribute to their mash-up images of the new Burj Khalifa on different world city skylines. Without doubt this building at 828m is a engineering and architectural masterpiece. I thought I’d choose the cities of Chicago, London and Kuala Lumpur; having visited the last two. I chose Chicago because it was long the record holder for the world’s tallest building (1974-1998), Sears Tower (now known as Willis Tower). I remember hearing stories of them changing the height of their antennas to steal back the title anytime a contender would knock them off the pedestal. It now stands at 527m high. I chose London because I wanted to contrast it with the beautiful building that is the ‘Gherkin’ (30 Street Mary Axe). London doesn’t have an impressive skyline but the Thames river is unmistakable. The Gherkin is only 180m high so through contrast really shows the size of the Burj. Kuala Lumpur was a challenge because it was a night time shot and there weren’t many night time pics of the finished Burj Khalifa available. The one I used had the fireworks display covering some of the building so I needed to do a bit of cloning. The Petronas Towers (452m high) are stunning and I felt dwarfed standing under them so can’t imagine how ridiculously tall the new Burj must be. 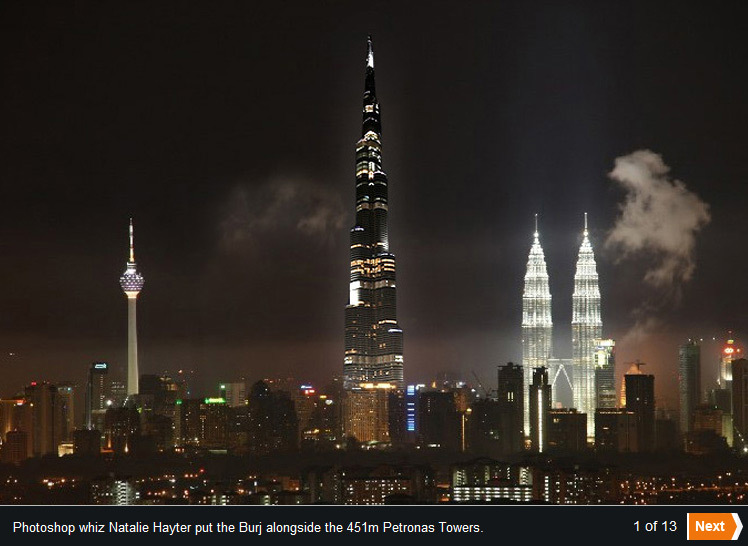 The Petronas stole the world’s tallest building title from Sears Tower in 1998 only to be pipped by Taipei 101 in 2004. In terms of getting the perspective right, I picked flat horizontal skyline pics to make the job easier. Did some research on wikipedia to get the heights to divide into the Burj height to work out the ratios. 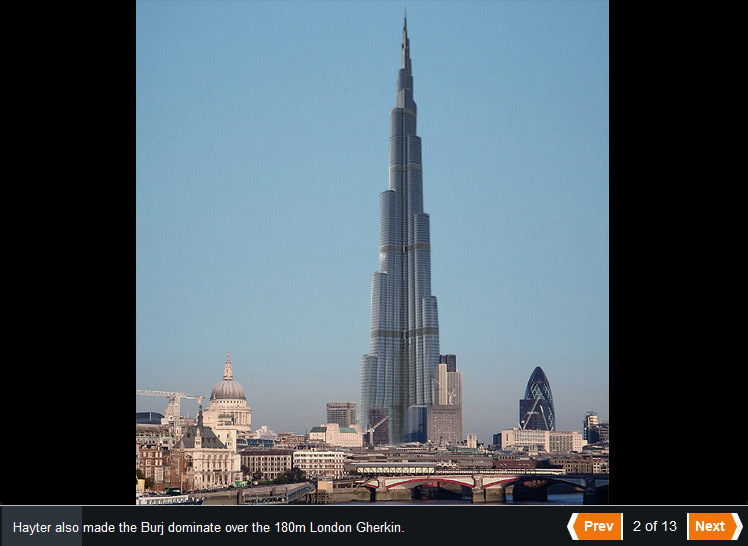 The Burj ended up being 4.6 times higher than The Gherkin. Your wish is my command, check out the latest posting. The McKell building is too much of an abomination to warrant a mashup with other such fine architecture. It would be so small you wouldn’t be able to see it anyway. You say London doesn’t have a good skyline. I strongly disagree. Any city with St Paul’s, The Tower of London, Tower Bridge, The Shard etc is going to look stunning. A combination of ancient and modern is sublime. Hi Hasa, please don’t misinterpret my comment as it was in the context of the two other skylines I was contrasting it to (KL, Chicago). They have tall skylines with huge skyscrapers. London has a very low skyline, bear in mind the article was written in 2009 – pre Shard days. I also agree, combo of old and new is great. Thanks for your contributions.